What is a dream beach? Is it the one closest to you or the one you need to push through the scented, but thorny Mediterranean vegetation to get to, in order to discover that little piece of land by the crystal-clear sea. Such beaches also offer delicacies that you can ‘harvest’ and prepare without any complications. Mussels, for example, are one of the most popular shells on the coast. Most people like to eat them cooked in olive oil (just enough until they open), with garlic, parsley, and white wine. The sea trapped in their shells is the only spice you need. Sandy beaches also hide tiny shells – groove carpet shells (‘vongole’), which can be easily picked with the help of little shovels, sieves and buckets, while warm sand under your feet will make you remember the pleasant feelings of forgotten childhood. This is the most expensive shell you can find at the fish market. The only thing more expensive would be the date shell, but this ‘obscure object of desire’ has been illegal for years now. Of course, there are also oysters. The only thing you need for them is a sharp knife, a drop of lemon juice and good company – both at the table and in your glass. The safest option is top quality, chilled Malvazija in Istria or, for example, Pošip in Dalmatia. The painful reminder of your encounter with a sea urchin in your foot can also suggest a very exotic dinner after returning from the beach. When you halve it, you will see small orange roe that you need to pull out carefully and gently, sprinkle with olive oil and pepper and spread on a slice of bread. If you collect more, like fine caviar, it will pair well with pasta. Experts suggest you look for deep-water, short-spined urchin, with spines that are purple at the base and white on top. Sea anemones can also leave unpleasant memories. Top restaurants offer fresh anemone, and it may be best not venture into preparing them at home. You should know that the anemone tastes like calf’s brains, and the very slight tingling sensation from their tentacles is reminiscent of non-existent pepper. It’s all about the basic taste of the sea, salt, and even some bitterness. A frequent souvenir from the beach is the purple dye murex, an edible marine gastropod mollusk. The meat is firm and it is normally cooked with the addition of Mediterranean spices and bay leaves – the best option is white-wine stew. It is said that the purest taste of the sea is captured in the small Vivaparidae snails, cooked in sea water and removed from the fire as soon as the water boils. Most people use needles to remove them from their shells, but some also use toothpicks. 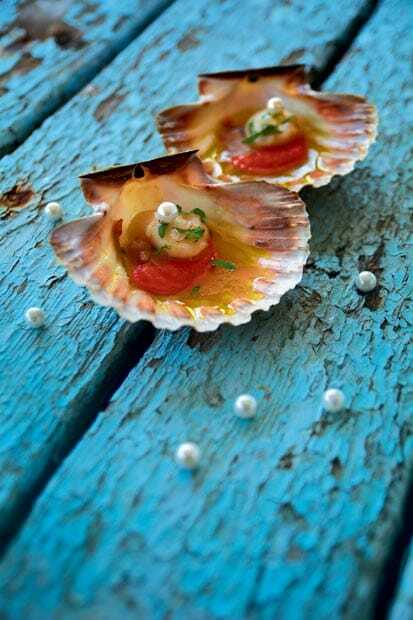 Limpets are another sea delicacy, eaten raw or cooked. They love flat and sheltered pleasant rocky beaches and their meat is the softest in winter months. Sautée limpets in olive oil, add garlic, mix with cooked pasta, and sprinkle with grated cheese. We should also mention the famous stone soup from a porous rock resembling a sponge that hides tiny crabs and shells in its holes. Add onion, parsley and a few carrots, and there you have it – a sophisticated, minimalist stew. At the beach, look for a smooth rock and you’ll find samphire, rock samphire or sea fennel. Its fleshy leaves are pickled in vinegar and added to cold seafood salads or served with cheese. Its taste resembles capers and asparagus, but it is much saltier. Small yellow crab, a type of crab that lives in shallow waters, has an excellent gastro reputation as well – it is used in soups, risottos, fish soups (‘brodet’) and combined with other seafood. If you decide to try and catch them, you will have a great time, filled with twists and turns and cunning moves, but look out for their claws. They are fast, unpredictable and have a ‘brave heart’. Adventure awaits if you go hunting for a nocturnal animal – the octopus. During the day, they hide in stone cracks or under rocks, sometimes even on the shore. This is when a spear and a candle will come in handy.An interesting fact – female octopuses are tastier, and the ideal mode of preparation is a cold octopus salad. Some people still don’t find these tasty delicacies worth a single pearl shell. And this is exactly Rovinj restaurant La Perla which offers a modern approach to gastronomy, combining sea and the land, vineyards and olive groves, as well as a very special ‘healthy’ garden cultivated by the Ružić family, and its patchwork of colours that serves as an inspiration in creating unique recipes. 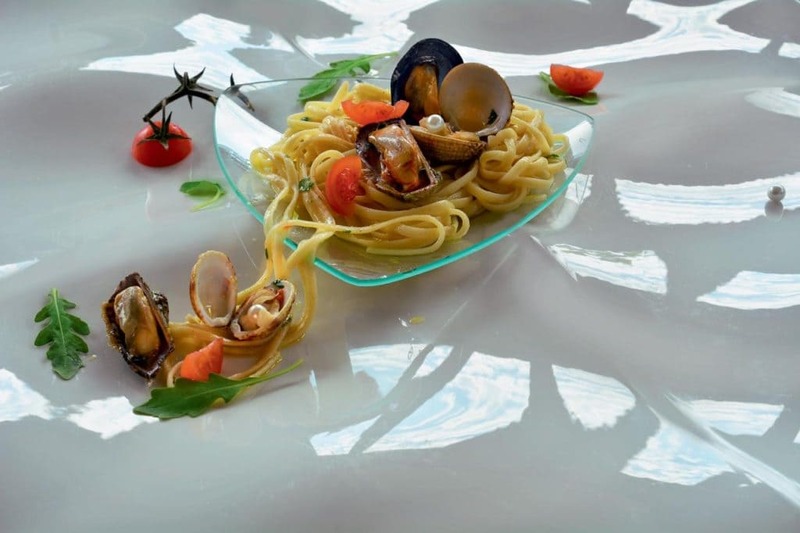 The artistic interior attracts the eye, but it does not outshine the meals on the plate. Edible decorations, content and guests leaving the restaurant satisfied, fed and happy – are this restaurant’s main guiding principles. Their fellow citizens love the restaurant as well, so they gladly recommend it to their guests, as well as we do. Word gets around and it tastes really good!